Forest Garden 8 x 12 Overlap Dip Treated Apex Shed: This garden shed has been pre-treated in the factory in a dip treatment that will act as a base coat for the timber preservative that should be periodically applied to prolong the life of your new shed and to validate the 10 year guarantee. This shed features a traditional apex roof design with a central ridge running front to back and a slope either side. This shed has a double door and 4 windows which you can construct either to the left or the right of the building depending on preference. This shed has a rough sawn overlap construction with square cut timber to help the rain water to run off the building and included shed felt to add a waterproof roof covering to help protect the shed and its contents from the elements. 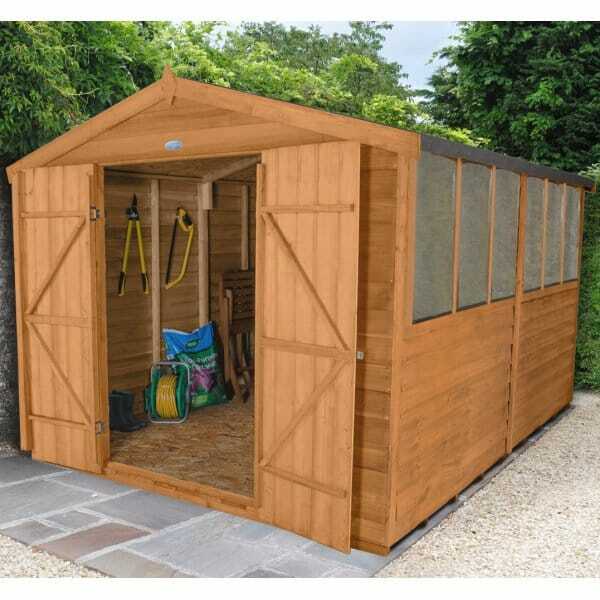 This garden shed has an OSB sheet material roof and floor which provides you with a hardwearing surface. The glazing on this shed is polycarbonate to ensure that there will be no breakages and that the windows will not become brittle or yellow over time. This Forest Garden shed is delivered in easy to manage parts and is a simple self-assembly proposition.